Angelo Porazzi is an Italian game designer and artist who illustrates his own self-published games and co-works with many authors, editors and websites. His website www.warangel.it contains PhotoReports of Italian Fairs since 2000, when Warangel was awarded in LuccaGames as 1st "Best Italian Game". "Career Award" received in PLAY Modena 2015. BOARDGAMEGEEK ESSEN 2011: Video of ASSIST the Family, Pokery Card Game, played with Beth and Scott Alden "I love this game". 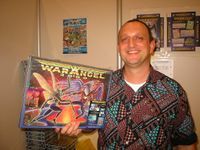 BOARDGAMEGEEK ESSEN 2010: Video of Create YOUR Warangel, with Angelo Porazzi and Derk Solko, both wearing the BGG American Football Team Jersey. Angelo with the #14, same number of his real Quarterback position, and the name WARANGELO dedicated on the back, great gift of Scott and Derk.